We have the habit of reading. The Internet made content discovery easier. It lets us find contents on any topic anywhere on the go using a device with net connectivity. What will do if you came across any interesting article, photo or video on the web? Share. You will share it with the friends or others who might be interested in the topic. Isn’t it? Social media sharing is a powerful option to spread your love towards a link. 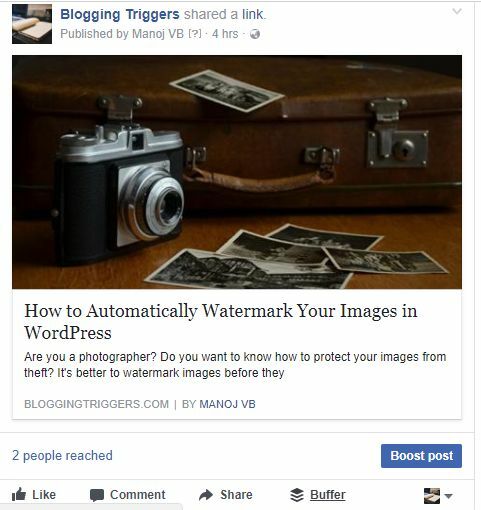 Every website shows social sharing buttons using which you can instantly share contents on your social account with a single click. They are for instant share. But how will you schedule shares and retweets for peak times to get the maximum exposure? We’re familiar with several social media automation tools. Buffer is popular among them. It is free and works across platforms, social media communities and pages. Buffer has dedicated apps for iOS and Android. So you can use it even on the road. Pinterest scheduling is another notable feature of the app. It allows you to choose a dedicated board each time to pin posts at the scheduled time. Pinterest scheduling is another notable feature of the app. It allows you to choose a dedicated board each time to pin posts at the scheduled time. 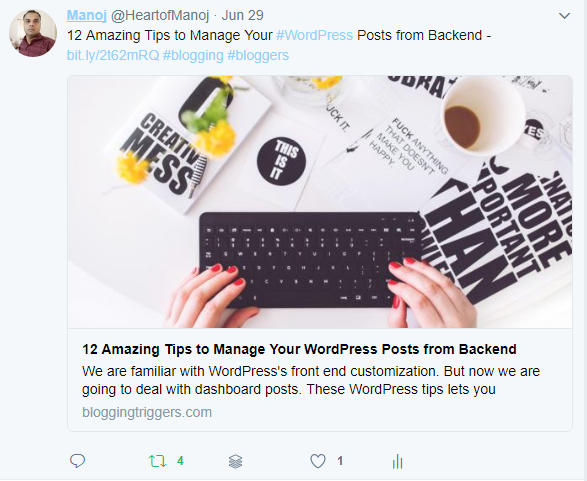 Sign up with Buffer and connect all your required social accounts. Go to Chrome tools library and install Buffer extension. After the installation, you will see a major change in sharing options of your social media accounts. It will add Buffer option under each of the social media posts. I would like to retweet it during peak times to improve the engagement. To schedule a retweet, just hit the retweet button on the bottom. A small window will open with Buffer Retweet and Retweet buttons. Click Buffer Retweet option. It will show all your connected profiles on Buffer. Click on the accounts that you don’t want to use this time. Upon click, their background will change into gray color. I selected just Twitter account for this post. I selected just Twitter account for this post. That’s why all other accounts appear in the gray background or hidden mode. Tap the down arrow that lies next to Add to Queue option. It will show three more sharing options including Share Next, Share Now and Schedule Post. Share Next: The chosen link will be added to your Twitter queue and share as next. Select any option. If you are opting for time-based shares, make sure that your account is in the correct time zone. Buffer lets you set different time zones for different accounts. So you can easily schedule posts across different time zones for social sites. Click Buffer button to show the relevant sharing menu. Choose your accounts and configure remaining options to schedule tweets, posts, pins etc. Open your post in Chrome. Tap Buffer icon to add the post or media to your Buffer queue. 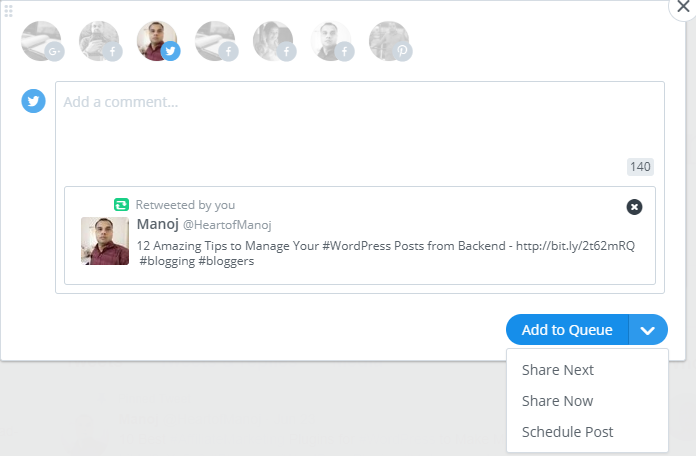 The same browser extension also allows you to instantly share or schedule the time for the share.